I love going into Mana Foods and perusing all the bulk items. 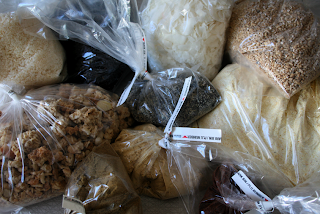 I wish I could bring each and every thing home I see in order to be able to try each and every spice and grain . There are so many things that I have never tried and would be so fun to have on hand. For instance, I found a recipe today that called for Cardamom ... which I don't have. Add that to the list. What does one do with Rose Hips other than make tea? There are actually a few things that I think I might be able to do without like the powdered chicken broth and split pea soup mix. It's also less expensive to buy bulk and simply fill up your existing spice jars or just store in the fridge/freezer.